So there we are, West Indies win the one and only T20 against England, and therefore the series. It's been a long evening - thank you for joining us. We will back for the first ODI between the two sides at Old Trafford on Tuesday. I will leave you with this clip of the winning moment. Goodnight. Man of the match Sunil Narine, who took 2-15 for West Indies: "It was good to come out and put in a good performance. It was tough conditions - very difficult with the wet ball in cold conditions. "It's a total team effort and well played guys. We were probably 15 runs short so I must give credit to the bowlers." England captain Eoin Morgan on West Indies' rapid start with the bat: "We didn't execute as well as we would have liked. Guys haven't played T20 cricket in a while and there's the challenge of bowling to two very good players." Anthony: What do you expect when you leave your best players out? England captain Eoin Morgan on Sky Sports: "We didn't bowl that well early on, but we certainly didn't lose the game because of that. We were happy chasing that. Losing the game was losing three wickets in that period. We continued to lose wickets, and that's the area we need to look at. "My form is always a concern - it's always a bit of a conundrum. But it's something I'm becoming more relaxed about as I get older." Chris Gayle scored 40 from 21 balls. Not bad for someone who played second fiddle. More from Carlos Brathwaite: "Evin Lewis has has been striking it cleanly, there were even times when Chris Gayle had to play second fiddle. Evin didn't get off to the best start but then took over when Chris left. "I am now heading off to Manchester to support the Red Devils against Everton tomorrow." West Indies have proved today why they are so good in this format of cricket. 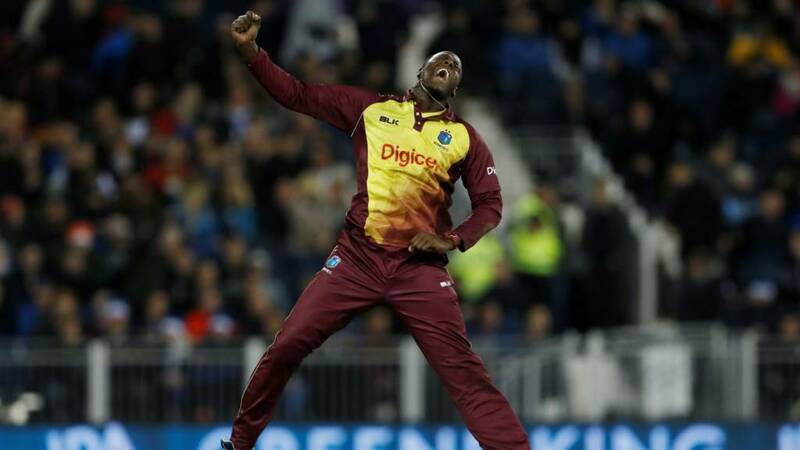 West Indies captain Carlos Brathwaite on Sky Sports: "This was probably the more challenging of our recent wins. Conditions were soft and slippery, the umpires were close to calling it off actually. "It was so bad and I asked the guys if they want to trudge on or call it a day. The umpires were in agreement with us but then we thought we will give it a go and see if there are any slips, and there wasn't." Mark Savile: Stokes & Ali sorely missed but well bowled WI. They bring the big names in and they delivered. Gayle smashed a quick 40. Evin Lewis is another exciting batter. And well done to their bowlers. Brathwaite changed the game with the wicket of Hales. This five-match ODI series could be interesting. So Stokes rested for 4hrs work when the Ashes are 2 months away... pathetic really. Brathwaite chopped and changed his bowlers really well. Their skills were far superior to England. They won the big moments. Bowled him! The leg stump is out of the ground! West Indies have won by 21 runs. It's been cold, wet and miserable for them at times but they have stuck at it. Pulled to the deep. Two more to the total. 22 from four balls needed. Plunkett on strike. Plunkett on strike. They squeeze two runs on the leg side. 24 from five needed. It's going to need a miracle. Superb bowling. Williams finishes with 3-35 from his four. England need 26 from 6 balls. They need something special. Something we will be talking about for decades to come. The bowlers have mixed up their changes of pace beautifully. Jordan had to go for the shot - he just couldn't quite get the distance. That was a good catch because he wasn't in position.